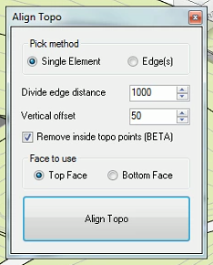 While browsing through a Revit Forum post, I noticed that someone mentioned an app that could align Topo to Slab Edges. 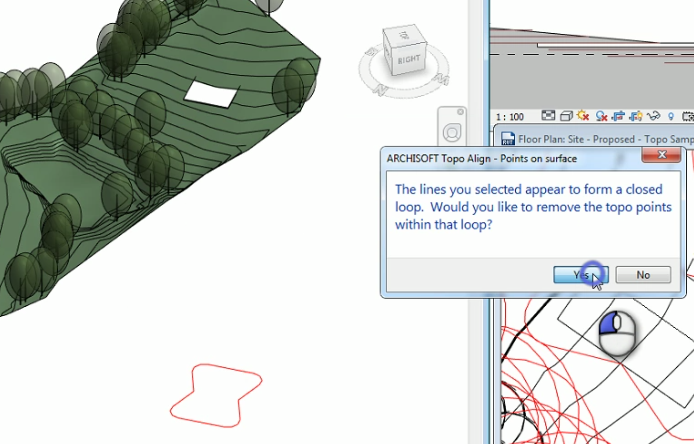 A quick search on the Autodesk Exchange turned up the Topo Align app. I have not yet had the chance to test it out myself, but even after just briefly looking at its features, it seems like a very worthwhile Revit add-in. And for a cost of only 1.99 USD, it is also a really good deal. If you frequently work with Toposurfaces, I highly recommend that you check it out. It has 3 features: Align to Element, Points from Lines, and Reset Region. All three features seem to be useful, though Align to Element is clearly the main tool. Align to Element will bring up a dialogue with a few options. 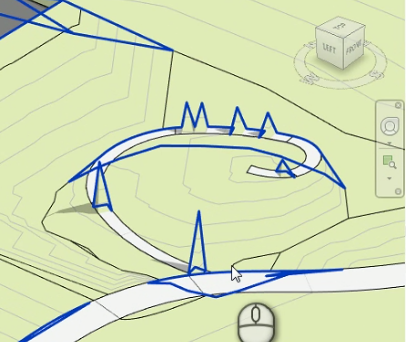 You can pick a single element, such as a Shape-Edited Floor, or the Edges of a Wall, and the Topo will add points along the specified faces or edges. The Remove inside points option doesn’t always work perfectly, particularly for more complex shapes, as demonstrated in one of the videos (which is why it is noted as a Beta feature). Points from Lines allows you to create points using a Line and a Toposurface. It essentially places points from the line (in plan) onto an existing surface. It also gives you the option to delete points within a closed loop. 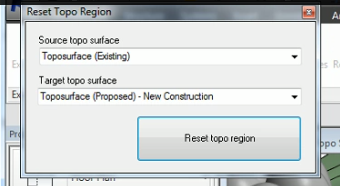 The third feature, Reset Region will actually copy points from one Toposurface to another. It seems to be limited to selecting regions using a bounding box, but it is still a handy feature since there is no other way to copy points between surfaces. Each feature has its own demonstration video, if you’re interested in seeing exactly how they work. And if anyone over at Autodesk is listening, this is easily the best Revit landscape/ site add-in that I have ever seen. It is both simple and relatively effective. There is some room for improvement (I’m thinking curbs and the ability to align Floor to Topo), but it is so much better than the cumbersome and glitchy Site Designer. I was just looking for something similar yesterday! Thank you so much for highlighting it. Finally downloaded this after your tip off. It’s a great tool for effortlessly editing topo. Autodesk could easily add these buttons to their Site tab!